In January, the videos started creeping onto YouTube, Vine, and Tumblr. They were distinguished by a sepia-toned freeze frame, an excerpt of the Yes song “Roundabout,” and an arrow that read “To Be Continued.” The videos spread well beyond the small group who understood the joke’s origins, and despite being little more than a wrapper to contain existing viral videos, they became a full-blown meme—and one with a storied internet lineage. The joke is simple enough: It’s a comic interruption—like a sitcom episode where the last line is cut off by the credits—employed in a manner and form similar to earlier memes like “Mmm whatcha say” and “unexpected [X],” and for most part slapped onto preexisting media. A kid tries to flip an omelette and we freeze on the pan snapping in half; a cyclist hits a rock and we freeze on his body sailing through the air; the lawnmower immortalized by the rustled jimmies meme takes flight to “Roundabout.” You get the idea. But to make sense of what the meme is and where it comes from, we’ll need to go back more than a decade. JoJo’s Bizarre Adventure is, by some measures, the seventh largest manga series ever written and one of the best selling of all time. It’s creator, Hirohiko Araki, has worked on it more or less continuously since 1986. But it took until 2003 for JoJo to officially cross the Pacific, where a Toonami-primed Western audience was finally able to read the translated series which follows multiple generations of fighting men, all nicknamed JoJo. Many of the earliest JoJo memes poked fun at poor translations. “Za Warudo”—a poor English-to-Japanese transliteration of “The World”—was among the most popular of this time, often shouted by the series’ main antagonist before literally stopping time and, in one instance, using his fourth dimension powers to drop a steamroller onto one of the JoJos. Others like “How many breads have you eaten?” and “Duwang” were more of the same. Poor localization made the series easy fodder for early English-speaking internet boards, and it’s intentionally ridiculous nature made it meme bait from the very beginning. Image: JoJo’s Bizarre Adventure, volume 3, chapter 25. Zeppeli and Dio’s panels during the aforementioned “breads” exchange. In 2012, an anime adaptation of the first JoJo story arc, Phantom Blood, was broadcast in Japan. Despite taking place in 1880s England, the series borrows heavily from 70s rock. Characters Dio Brando, Robert E. O. Speedwagon, Will A. Zeppeli, Bruford, and Tonpetty, are laughably bald references. As in the meme, each episode ends with a “To Be Continued” arrow—a sepia freeze frame timed to coincide with the bass and drum hits in the first track on Yes’ 1971 double platinum album Fragile. The arrow and freeze frame would remain a staple of future seasons, while “Roundabout,” to the chagrin of progressive rock fans, would not. While Phantom Blood was still airing, the earliest precursor to the meme began circulating. More in the vein of a mashup than a codified internet joke, the video borrows the JoJo outro elements, overlaying them onto the ending of a Madoka Magika episode intended to draw a parallel between two similar moments in these shows. It would be two more years before Crunchyroll—the anime streaming service—made Phantom Blood available to a global audience. Many of the most popular anime in recent years, like Kill La Kill and Attack on Titan, were broadcast simultaneously in Japan and online—and the same became true of the most recent JoJo season, Diamond Is Unbreakable (DIU). 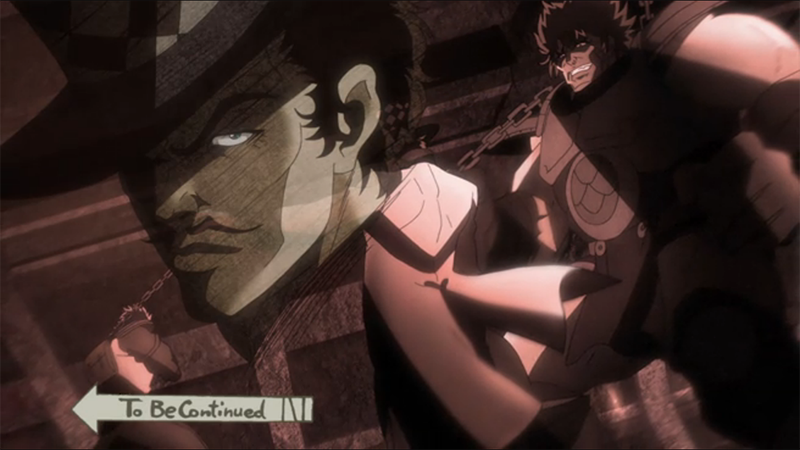 A DIU teaser heavily featuring the To Be Continued arrow first appeared in October, 2015, with trailers following over the next few months. As excitement for JoJo mounted, the meme began to coalesce. Know Your Meme lists the first instance of To Be Continued as being posted to Vine on January 27th, although markedly less popular (extremely loud) Vines from creator Flozzeraxe predate this. In both cases, the JoJo ending from Phantom Blood is applied to the existing memes of Squidward dabbing and Hank Hill listens to X. For his part, Flozzeraxe does not claim to have created the meme and recalls being exposed to an earlier iteration on iFunny which has yet to be found and may have since been deleted. In February, To Be Continued got a dedicated YouTube channel, which has since garnered nearly 5 million views in total, and by all accounts is primarily responsible for popularizing the meme. A thread on Reddit’s OutOfTheLoop indicates this was approximately when To Be Continued began to extend beyond fans of the anime series. The channel creator declined to speak to Gizmodo. That time a guy threw a shoe at former president George W Bush.